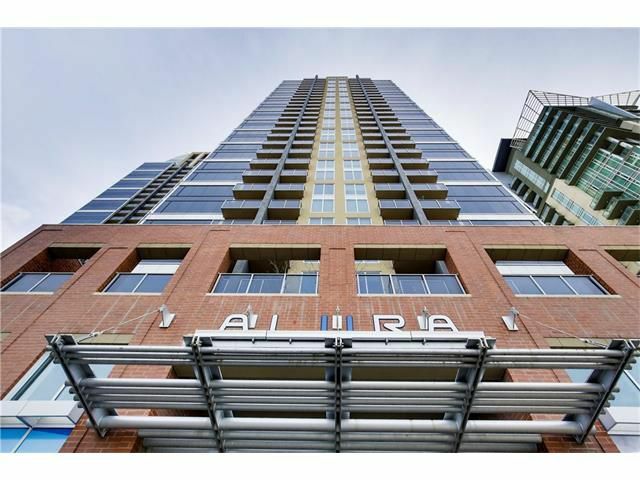 Welcome to Alura, a rarely available, SOUTH WEST CORNER UNIT with unparalleled VIEWS of the MOUNTAIN AND DOWNTOWN!! This stunning and immaculate 2 bedroom, 2 bath corner unit on the 17th floor, offers an inviting open concept kitchen with huge windows, quartz countertops, upgraded stainless steel appliances and rich cabinetry. Functional & spacious living room for entertaining, large master bedroom with walk in closet & 4 piece ensuite, in-suite laundry includes a full size stacked washer & dryer. Alura & her sister tower Nuera share amenities including state of the art gym, steam room, party room, business center & landscaped terrace, 24 hour security & concierge service. Bike storage, titled parking & storage locker. All of this and all within walking distance to the core!! Steps from shops, restaurants, entertainment, the arts, C-Train, Saddledome, Stampede Grounds, the Elbow River pathway & Lindsay Park Rec Centre. Call your favourite Realtor to view!! Buyers: for an additional $6,000 the seller will include all of the furniture! !